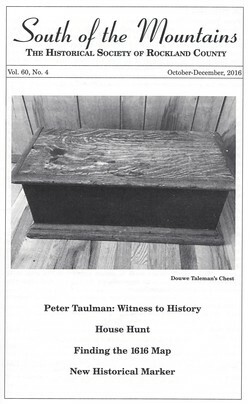 The author, Peter Douwe Talman, grew up in Spring Valley and now lives in Lord's Valley, Pennsylvania. He is the president of the board of the Welton Heritage Center, the local historical society, established in 2010 and growing rapidly. His article, "The Sentinel to My Past: Remembering the Building of the Thruway,: about the impact of the New York State Thruway on his family's farm appeared in the October-December 2009 issue of South of the Mountains. Pete is directly descended from Douwe Harmanus Taulman, making him the great-great-great-great-nephew of Peter Taulman. Your editors track down the location of Peter Taulman's house in Piermont. The author, Larry Singer, has been on the board of the Historical Society since 2012 and served as the president for the year 2014-2015. He organizes the Student History Conference, the History in Your Own Backyard series and the Tappan Zee Experience boat trips. Larry was a mathematics teacher at North Rockland High School for 38 years and has practiced law since 1982. He lives in Thiells. The Historical Society's 80th historical marker was dedicated on August 18 and commemorates the 914 Sound Recording Studios in Blauvelt. COVER PICTURE. Chest made by Peter Taulman's grandfather, Douwe Taleman, circa 1720. From the collection of Peter D. Talman.